Two tools in one! In its simplest aspect, the Responsive Images Toolkit allows you to quickly insert responsive, scalable images and optionally style them with rounded corners, borders, and even shadows. For the connoisseur of modern CSS, however, it is so much more. The UI also allows you to use the HTML5 picture tag and SRCSET Attribute, giving you a means to serve separate images based on the viewing device's viewport size. The viewing device (desktop/laptop/phone/tablet) will download and display only the image that meets the criteria you set in the toolkit's UI, thereby saving bandwidth in the most efficient way possible. 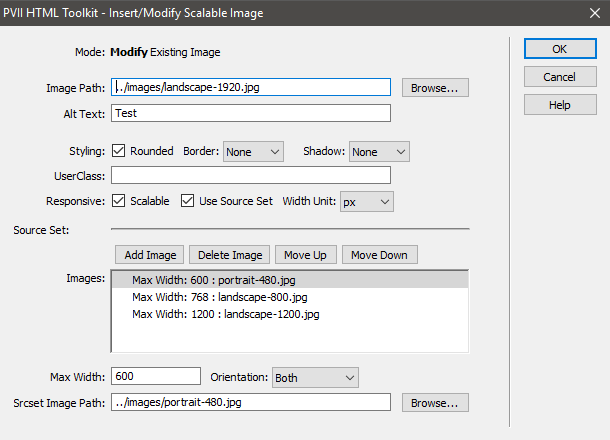 The PVII Responsive Images Toolkit is a productivity tool that enables you to manage the most important aspects of your site's images— from inserting them, to styling them, to making them responsive—all from the comfort and safety of an intuitive user interface—with absolutely no coding required. 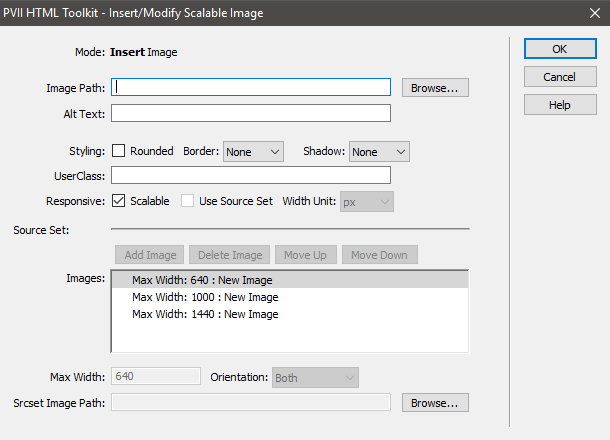 Like all PVII tools, the Responsive Images Toolkit makes Dreamweaver better: better than Bootstrap, better than online web site builders, better than Dreamweaver is without it. PVII HTML Toolkits and Page Builders are made to allow Dreamweaver users to leverage the power of modern CSS and HTML methods without having to learn a new application, and without having to know code. Whether you are a web design novice, or a master of CSS, PVII tools make your life easier and your time more productive. No other Dreamweaver extensions or plugins, and no feature that comes with Dreamweaver, can even compare. The above image was inserted with The Responsive Images HTML Toolkit. A specific image will be served based on the browser/device viewport size. To test in a desktop/laptop browser, adjust the width of your browser window, observing the width label superimposed over the image as your window's width is adjusted up and down. You can also load this page on an actual phone or tablet.